OSHA is proposing to delay the effective date of the rule entitled Occupational Exposure to Beryllium, from March 21 to May 20 to allow for further review and consideration. The extension is in keeping with a Jan. 20 White House memorandum that directed the review of any new or pending regulations. It would not affect the compliance dates of the beryllium rule. Comments on the proposed delay will be accepted through March 13 and can be submitted at www.regulations.gov. For more information, see the news release. OSHA is offering free safety and health training classes to employers and workers at the annual Pacific Coast Safety Fest. Safety Fest conferences are currently scheduled March 6-10 in the cities of San Diego, Los Angeles, Phoenix, Las Vegas, Honolulu, and the San Francisco Bay area. Topics covered will include OSHA’s cooperative programs and on-site consultations, fall prevention, health hazards, confined spaces and evacuation and emergency planning. Most events will also hold OSHA 10-hour safety trainings courses for general industry or construction, some of which will be available in Spanish. To get specific dates, agendas and to register, visit the event website. Last year, more than 1,900 workers participated in a stand-down event at the construction site of the MGM Casino in Oxon Hill, Md. Employers and workers are invited to participate in the fourth annual National Safety Stand-Down to prevent falls in construction, to be held May 8-12. Sponsored by OSHA, the National Institute for Occupational Safety and Health and CPWR — The Center for Construction Research and Training, the weeklong outreach event encourages employers and workers to pause during the work day to talk about fall hazards and prevention. Falls are the leading cause of death in the construction industry – accounting for 37 percent of fatalities industry-wide. In past years, more than 1 million workers participated in events. They have worked for public and private sector employees and small and large businesses. The event has recently expanded to include industries beyond construction. For more information on how to join in this year’s stand-down, access free training and education resources in English and Spanish, and receive a personalized certificate of participation, visit OSHA's webpage. 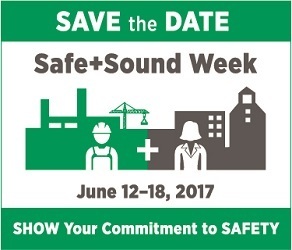 OSHA, the National Safety Council, the American Industrial Hygiene Association, the American Society of Safety Engineers, and the National Institute for Occupational Safety and Health a have announced June 12-18 as Safe + Sound Week. The event is a nationwide effort to raise awareness of the value of workplace safety and health programs. These programs can help employers and workers identify and manage workplace hazards before they cause injury or illness, improving the bottom line. Throughout this week, organizations are encouraged to host events and activities that showcase the core elements of an effective safety and health program--management leadership, worker participation, and finding and fixing workplace hazards. Visit the Safe + Sound Week webpage to sign-up for email updates on the event. A daylong safety summit for employers and workers will be held June 13 at the University of Massachusetts in Amherst. Regional and national experts will hold workshops on topics such as silica, ergonomics, process safety management, electrical hazards, OSHA requirements for recordkeeping and walking and working surfaces. For more information and to register, visit the Summer Summit website. Cassemco Incorporated, a Tennessee-based foam product manufacturer, recently renewed its status in OSHA's Safety and Health Achievement Recognition Program. Cassemco first became a SHARP participant 18 years ago, after implementing workplace safety and health recommendations made by OSHA's On-site Consultation Program. SHARP requires that the employer have injury and illness rates below the national average for their industrial classification. Cassemco has had zero recordable incidents in the past three years and nearly 150,000 work hours, maintaining an injury rate 20 percent lower than the average for its industry. For more information, Cassemco's success story. OSHA and the Allied Construction Industries have renewed their Strategic Partnership to protect the safety and health of construction workers in Ohio. The trade association, representing more than 500 member companies, first signed a partnership in 2000 with OSHA's offices in Cincinnati and Columbus to reduce injury and illness on job sites in that state. The renewed partnership will promote increased training, daily work shift safety meetings, safety orientations, safety and health programs, and stand-downs designed to increase workers' knowledge of hazards and safety procedures in construction, concrete masonry, sheet metal, electrical, heating and air conditioning, and finishing trades. For more information, see the news release. The OSHA Alliance Program fosters collaborative relationships with groups committed to worker safety and health. Two groups recently renewed their alliances with OSHA to develop industry-approved compliance assistance resources and educate employers and workers about workplace hazards. These alliance partners will continue to help OSHA reach targeted audiences, such as employers and workers in high-hazard industries, and give them better access to workplace safety and health tools and information. Electrical unions and contractors in Atlanta renewed a five-year agreement to prevent exposure to electrical transmission and distribution equipment hazards. The state of North Dakota and the MonDaks Safety Network renewed a five-year agreement to reduce the number of occupational exposures to physical and chemical hazards in the upstream oil and gas industry. OSHA has updated the $afety Pays Program to include the most recent workers' compensation data from the National Council on Compensation Insurance. The program helps employers understand the impact of workplace injuries and illnesses on their company's profitability. OSHA provides many resources to help employers develop an effective safety and health program to improve safety and reduce costs. Benefits include reduced absenteeism, lower turnover and workers' compensation costs, higher productivity and increased morale. 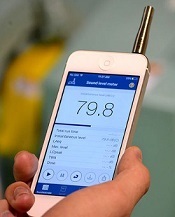 The National Institute for Occupational Safety and Health has developed a new, free mobile application for iOS devices that measures sound levels in workplaces. The NIOSH Sound Level Meter app displays real-time noise exposure data based on NIOSH and OSHA limits. The easy-to-use app can be particularly helpful to occupational safety and health trainers as they teach construction apprentices about noise hazards and the need for hearing protection. Visit the app webpage for more information. Michigan Occupational Safety and Health Administration issued citations to Dunn Paper Inc., in Port Huron for safety and health violations. MIOSHA inspectors determined that the company failed to adequately protect workers from amputation hazards posed by cooling fan blades, spinning flywheels and belts and pulleys. The company was also cited for failing to provide fall prevention barriers around an open-sided elevated platform and open holes, and for not properly training workers on the safe use of rented aerial work platforms. Nevada Occupational Safety and Health Administration issued citations to East Fork Roofing LLC in Carson City for safety violations. Nevada OSHA inspectors concluded that the company failed to protect workers engaged in roofing activities from fall hazards. Workers on a low slope roof, 10 feet above ground level, were not provided with guardrail systems, safety net systems, personal fall arrest systems, a warning line system or safety monitoring system. OSHA reminds employers of their obligation to post a copy of OSHA's Form 300A, which summarizes job-related injuries and illnesses logged during 2016. The summary must be displayed from February through April in a common area where notices to employees are usually posted. Businesses with 10 or fewer employees and those in certain low-hazard industries are exempt from OSHA recordkeeping and posting requirements. OSHA is not accepting electronic submissions of injury and illness logs at this time. Updates will be posted to the recordkeeping webpage.